I’m aware of at least two things going on in Portland for Darwin Day on February 12th. The Center for Inquiry-Portland will be hanging out between between the Smith and Neuberger buildings on the Portland State University campus from noon to 3:30, passing out cake and talking to people about evolution (last year and 2011 it was at Pioneer Square). 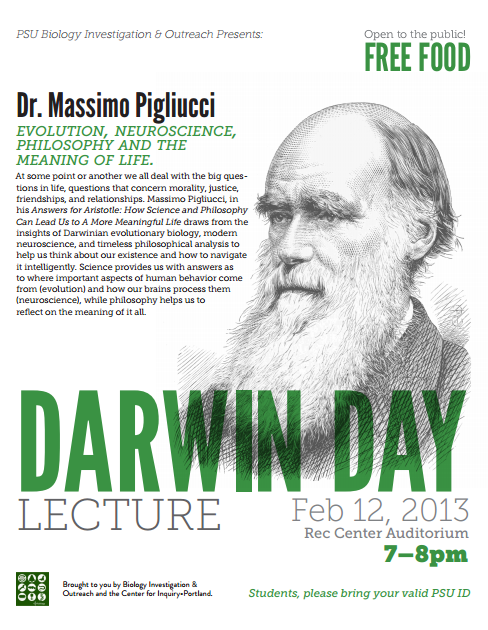 Massimo Pigliucci of the City University of New York will give a Darwin Day talk on the interaction between philosophy and science at 7:00 pm, in SB1 107 (see below for update on location) on the campus of Portland State University. Details on the Meetup page here. This entry was posted in C.R. Darwin, Darwin Day, evolution, portland by darwinsbulldog. Bookmark the permalink. Center on the campus of Portland State University.